Eurodoc 2016. 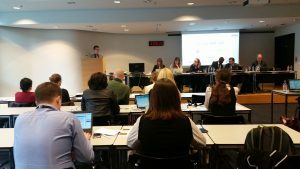 Early stage researchers’ training: which future? 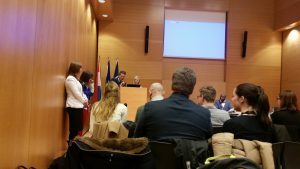 Eurodoc and luxdoc (Luxembourg’s Young Researcher Association) organized the 2016 annual Eurodoc conference on the topic of the future of young researchers in Europe. 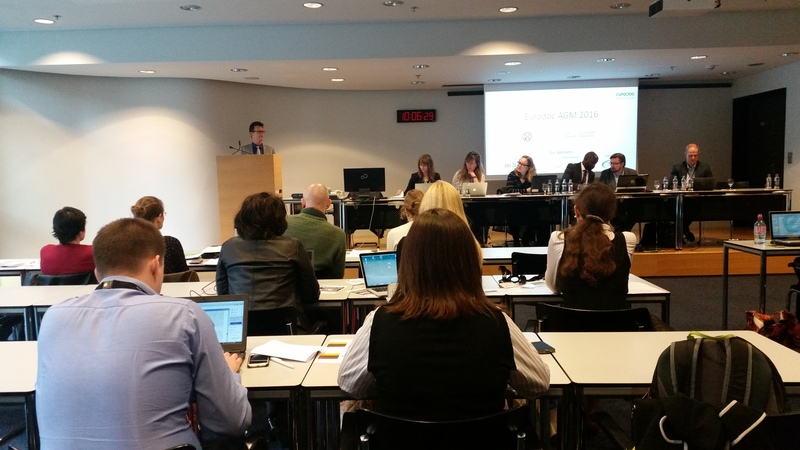 Parliamentarians, colleagues of the European Commission, experts of funding agencies and PhD candidates from all over Europe discussed modern ways of defining postgraduate training goals, cross-border collaborations, European funding schemes, and good practices in doctoral training. It was commonly agreed upon that due to the rising number of PhD candidates in Europe and underfinanced higher education systems in many European countries, many young researchers are not able to find a position at universities even though they had planned to. In a Dutch survey it was shown that (1) more than 60% of PhD candidates want to work in academia even though only 30% remain and (2) that most PhD candidates have only prepared for a career in academia. Therefore, for young researchers mobility and networking is important as well as soft skills training and the ability to “sell” their PhD experience to the private labour market. In this respect, there is a need for PhD candidates to start thinking early about their future plans rather than only in the final year(s). Additionally, funding schemes were presented and discussed e.g. Funding Schemes Europe (https://erc.europa.eu/funding-schemes) as well as bilateral university programmes, e.g. Deutsch-Französische Hochschule (https://www.dfh-ufa.org/startseite/). Particularly enlightening were the presentations from PhD candidates from Croatia, Slovakia, Poland and the Ukraine about their academic systems, especially how their PhD training is organized and how cross-country collaboration (e.g. Poland/Ukraine) is implemented. These presentations impressively showed the diverse higher education systems in Europe. We thank luxdoc for organizing such an interesting conference! During the Annual General Meeting, the goals for 2016 were ratified by majority votes from the participating delegates. The new board was thereafter chosen, including president (Ewelina Pabjańczyk-Wlazło, KRD, Poland), vice-president (Julija Baniukevic, LJMS, Lithuania), treasurer (Péter Miklós Kőmíves, DOSZ, Hungary), secretary (Antoine Dujardin, CJC, France) and general board members (Iryna Degtyarova, RMU, Ukraine; László Kövér, DOSZ, Hungary; Fulvio Rizzo, FUURT, Finland). In addition, the work group coordinators, policy officers, webmaster and advisory board were elected. Outside of the ratified goals for 2016, a significant part of the discussion revolved around the topic of financing and continuity of governance. Eurodoc wants to foster long-term planning and structure by potentially having the president serve for multiple years in time. In order to achieve this goal, the president of Eurodoc would likely have to be a hired and paid position. Currently, the budget of Eurodoc consists of funds awarded for specific EU projects and membership fees. Neither of these sources is sufficient to finance a permanent position, as the former is earmarked for specific projects and the latter is by-and-large spent on travel refunds and event organization. Furthermore, membership fees were waived or reduced for Serbia, Russia, Latvia, Ukraine and Croatia due to the economic situation of these nations (Belgium was also exempted of membership fees due to them providing legal and financial support for Eurodoc). To further promote longevity, one of the goals for 2016 calls for the creation of a Eurodoc archive and social media presence, which might also incur further costs. It remains to be established what source of funding (public or private donors; EU funding or other) will ultimately serve all these purposes.